Some of the best service we have ever had. Very nice pepole. Answer all our questions. Thank you for showing your beautiful cabin with us. Perfect place to spend Fathers Day. Thank you so much for sharing your beautiful cabin. We spend a long weekend here and enjoyed the views, the peacefulness and the fun activities here in your cabin. We hope to visit again some time in the near future. Beautiful Cabin!! We loved everything about this cabin. This is the best rental we have ever stayed in. The view, the privacy, thank you for allowing us to enjoy your paradise! We enjoyed the train trip, white water rafting, but always ready to come back and relax on the front porch! Want to come back in October. Thank you again for letting us stay in this beautiful cabin. We enjoyed out stay at Bear Moon Lodge. 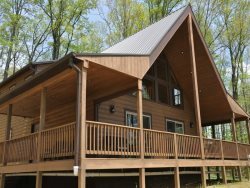 We will stay with Great Smokys Cabin Rentals in the future. Absolutely beautiful. Perfect romantic getaway. We drove from Madison, NC to stay for the weekend. Had an amazing time. The Iron Skillet has the best breakfast ever. Thank you for letting us stay here and enjoy this cabin. We really enjoyed our weekend getaway. This was the perfect place to celebrate our 10th wedding anniversary! Everything was clean and comfortable. Thank you for a beautiful weekend. The Henderson Family had a great time in Bryson City and enjoyed using the cabin as a "home base". We did it all- waterfall hikes, railroad, white water rafting, tubing, outdoor theater in Cherokee, zip lining, music in the park, Fontana Damn. We had 3 families sharing the cabin and we really enjoyed the space here and thoroughly enjoyed relaxing in the hot tub. 27th Anniversary week. We always rent a cabin for 8 days. But this was by far the best view ever. 9 day stay, 8 days mountain biking Tsali and Jack Rabbit. Tradition to hit Kosta's in Sylva and Frymont Inn. Unlike other trips this one was spent mostly at the cabin rather then traveling the area. WE will certainly be back.